Government has issued notification w.r.t. 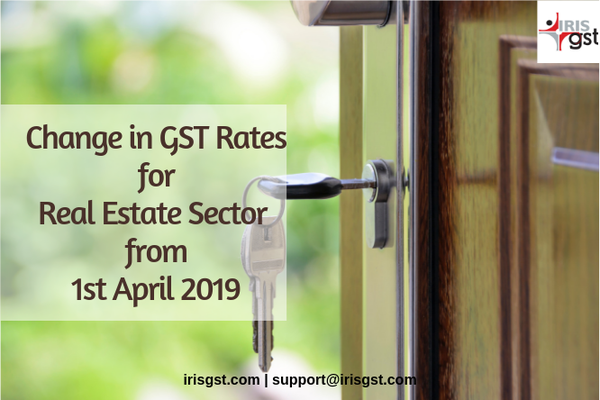 changes in GST rates for real estate sector with an option to charge new tax Rate from 1st April 2019 for ongoing projects. If no option is exercised then new rates will be applicable. Option is to be exercised by 10th May 2019 in Annexure IV. Tax shall be paid in cash, that is, by debiting the electronic cash ledger only. Cement to be procured from registered person. In case it is procured from un-registered person, applicable GST on cement is to be paid under reverse charge in the month in which cement is received. After considering above payment of tax on cement, total 80% of procurement should be from registered person. In case of shortfall, GST should be paid @ 18% under reverse charge. Such computation of 80% should be done on financial year basis. For calculation of such 80% of procurement, services by way of grant of development rights, long term lease of land (against upfront payment in the form of premium, salami, development charges etc.) or FSI (including additional FSI), electricity, high speed diesel, motor spirit, natural gas shall not be considered. The tax liability on the shortfall of inward supplies from unregistered person so determined shall be added to his output tax liability in the month not later than June following the end of financial year. GST ITC not availed shall be reported every month by reporting it as ineligible credit in GSTR-3B. apartments being constructed under the project have been, partly or wholly, booked on or before the 31st March, 2019. Explanation.- For the purpose of sub- clause (a) and (b) above , construction of a project shall be considered to have started on or before the 31st March, 2019, if the earthwork for site preparation for the project has been completed and excavation for foundation has started on or before the 31st March, 2019. A residential apartment in a project which commences on or after 1st April, 2019, or in an ongoing project in respect of which the promoter has not exercised option in the prescribed form to pay central tax on construction of apartments at the rates as specified for item (ie) or (if) against serial number 3, as the case may be, having carpet area not exceeding 60 square meter in metropolitan cities or 90 square meter in cities or towns other than metropolitan cities* and for which the gross amount charged is not more than forty five lakhs rupees. The net usable floor area of an apartment, excluding the area covered by the external walls, areas under services shafts, exclusive balcony or verandah area and exclusive open terrace area, but includes the area covered by the internal partition walls of the apartment. such other person who constructs any building or apartment for sale to the general public.